Sehr schöne Tour, landschaftlich einzigartig! Beautiful coastal path along the impressive cliffs of Moher with outstanding views. Walk out of Liscannor past fields and farms on tarmac roads with some little ascents. When you reach the Cliffs of Moher coastal path the route turns into a smaller trail. You have a lot of viewpoints along the way and will enjoy the awesome cliffs. Around the visitor centre the path might be a little bit busy because of the tourists that come just to see the cliffs. 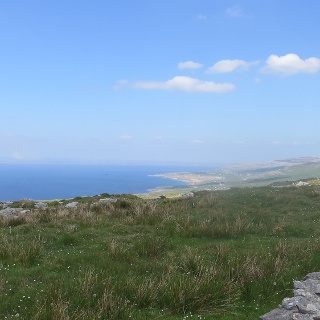 A few kilometers ahead the way turns into an idyllic single trail again and you have to step over some wooden fences, then crossing some fields and little streams to reach Doolin. There are no major ascents or decents on the last part of this stage. Take your time and stay a while at the cliffs when you find a good place to stop. Around the Cliffs of Moher Visitor Center it gets busier, so a good recommendation is to pause a few kilometers before or in front of the visitor center. If you don't feel comfortable walking on the path close to the edge there is another route behind a fence, that goes parallel to the original way. You will see it. Please. take care of the fence as it may be electric. Be careful and don't go to close to the edge of the cliffs. If it's windy it would be better to stay on the optional path behind the fence. When you are walking on the tarmac roads, there are no pavements, so be careful with the traffic and walk on the opposite side of the road. If the weather is nice don't forget your sun cream and sun hut. Even though this is Ireland you can still get burnt! Take your rainproof jacket and trousers/pants with you as the weather can change in a heart beat. As you are not walking on difficult terrain we would reccommend wearing some comfortable walking shoes, but walking boots are not necessary. During your walk you will pass the Cliffs of Moher Visitor Center. Here you can find a toilet and opportunities to buy some snacks and drinks. 0.00 km - With your back to the accommodation TURN RIGHT and follow the main street. Take care of the traffic (left-hand traffic). Continue STRAIGHT ON down the main street. There is a gas station to your left. 1.00 km - TURN LEFT into the L1068 road. There are signs for Liscannor mobile home park, Injury Clinic & Pilates and Pak’s Cottage. 1.10 km - TURN LEFT and follow the direction to Liscannor mobile home park (You will see waymarkers here). You are walking through a neigbourhood on a tarmac road. 1.50 km - Follow the street, that curves right and go STRAIGHT ON. 2.50 km - You reach the edge of a little cliff. The water is to your left-hand side. Keep STRAIGHT ON and follow the street. At 2.90km there is an infopoint and viewpoint to your left-hand side. You'll find some information about John Philipp Holland and Liscannor on it. 3.10 km - The road curves right, keep STRAIGHT ON on following it with the sea to your left-hand side. 4.30 km - You will reach a junction. TURN SHARP LEFT and you will see a waymarker for Burren Way to your left-hand side. Go STRAIGHT ON. 6.00 km - TURN RIGHT. Here there is a waymarker for Cliffs of Moher Coastal Walk Car Park. 6.50 km - When you see the two metal gates infront of you TURN LEFT. 6.70 km - You can see the car park to your left-hand side. The street changes into a gravel path. Keep going STRAIGHT ON and follow the track. 7.30 km - You reach two metal gates. Take the left one and use the little stony steps on the left side for going through the gate. Go STRAIGHT ON and you will go through two more gates in the next 500m. 7.90 km - The path is getting tighter and changes to a little single trail. Go STRAIGHT ON on the track. There is a fence on your right-hand side and the sea to your left-hand side. You have reached the Cliffs of Moher Coastal path now. Look at the beautiful cliffs but be careful and don’t step to close to the edge. 12.20 km - The Cliffs of Moher visitor Center is to your right-hand side. Keep on following the track and go STRAIGHT ON. There are some stone steps in front of you. Go up these steps and after 500m you’ll reach a little tower and viewpoint. There is a small entrance fee for going upstairs at the tower. 13.30 km - You reach a Y-Junction, BEAR RIGHT and follow the path downhill along a fence, that is on your right-hand side. 13.50 km - TURN RIGHT and follow the trail. 13.70 km - You have to go through a metal gate again. Then TURN LEFT. 13.80 km - Go through another gate with the steps on the left-hand side. TURN SHARP LEFT after the gate and you will see a stone hut in front of you. TURN RIGHT after the hut and follow the path with a stone wall to your right-hand side. 13.90 km - You reach a field. Go STRAIGHT ON and cross the field along the fence on your left-hand side. There is another path on your left-hand side behind the fence. Just ignore this one. 14.20 km - The path on your left comes to an end. Go STRAIGHT ON and keep on crossing the field. 14.30 km - Step over a wooden fence and cross the little stream. Keep going STRAIGHT ON with a fence to your right-hand side and the stream to your left-hand side. 14.50 km - Cross another fence and TURN LEFT once you have corssed it. You’ll see the sea in front of you. 14.60 km - Follow the track, it curves right. The sea is now on your left-hand side and the fence to your right-hand side. Go STRAIGHT ON and step over a wooden fence again in 400m, then follow the gravel path. 15.50 km - Here there is another viewpoint to your left-hand side: Pal’s view. Enjoy the nice view over the cliffs of Moher and go STRAIGHT ON. 15.60 km - TURN RIGHT. You’ll see Doolin already from here. Almost done! 15.90 km - TURN LEFT and follow the path uphill. 16.10 km - TURN RIGHT. The sea is to your left-hand side again and a fence to your right-hand side. 16.80 km - Step over a wooden fence and follow the track STRAIGHT ON. There are two more wooden fences to cross in the next 700 m.
18.60 km - You reach the end of the gravel path and the way turns into a tarmac road again. There is a house to your right-hand side and you go through a metal gate. Go STRAIGHT ON down the street and beware of the cars. 19.10 km - You reach a junction. Welcome to Doolin! Here is a stony bridge and some pubs and stores to your left-hand side. Here is where your walk finishes.